This post about Walgreen and Dove Mother’s Day promotions have been compensated by Global Influence. All the opinions expressed are 100% my own. When you single without children I spent a little more time on my beauty routine, mainly because I was headed to work and then most likely out with my girlfriends or on a date. Once I was married with out kids, I still spent extra time blow drying my hair, applying the right moisturizer etc. My perception of what beauty meant was definitely more focused on myself. However, three kids later, my perception of beauty was reflective on my children and no longer on myself. I made sure they had plenty of moisturizer on their baby skin and the best sunscreens to protect their fragile skin. When the kids were babies I was lucky to even grab a daily shower. I usually waited until I went to bed and blow drying my hair became a luxury. The few pictures I am in, I have a hair net on!! Would not give up these experiences but maybe I should take a little more effort for photos. It is time to take back time for ourselves and Walgreens and Dove products is making it easy for you with their new Mother’s Day Promotions. Many moms lose their sense of sense when they become mothers and in fact let themselves go in many ways. Dove and Walgreens are committed to building positive self-esteem and inspiring women to reach their full potential, acknowledging that beauty is defined in different ways. Mothers Day is the time to sit back and smile back at ourselves and love what we have become, mothers, the hardest profession out there. This Mother’s Day, Dove and Walgreens want to show the moms in your life just how special they are. 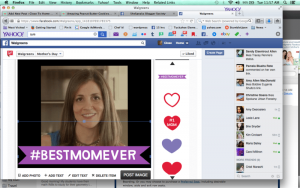 Head to Walgreens Facebook and create your customized Mother’s Day photo! It is super easy and will take photos right from your Facebook account. Maybe you want to add a photo of you and your kids to your Facebook account so you just don’t bring home a 8×10 of yourself. Better yet make one for a special mother in your life. 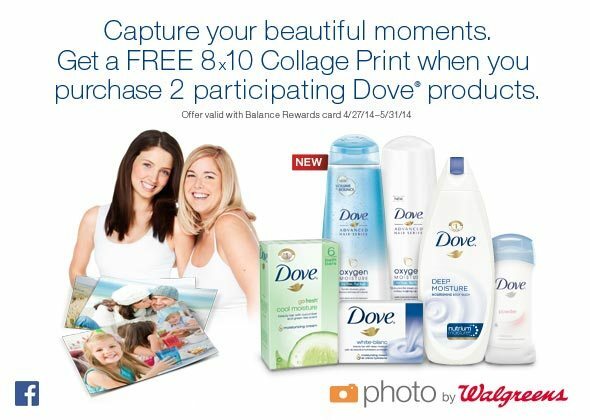 Purchase 2 participating Dove products at Walgreens and receive a promo code on your receipt to redeem a Free 8×10 collage print! (Offer valid with Balance Rewards card 4/27/14–5/31/14.) For this Mothers Day promotion they are offering a BOGO 50% off. How has your sense of beauty changed since becoming a mom? Like most of your readers, I am a fan of Dove products and the Dove movement to empower girls and women to appreciate the beauty within themselves. Love Dove products. Great promotion they have. I love Dove products and all their efforts to empower girls. The picture of you in the hair net is adorable! We use Dove products for years. It sounds like a great campaign for women too. Awww… this is lovely! I’d love to create my own bar! Dove is doing so many great things nowadays. I have always loved them but appreciate what they do as well! I am not a Mom but everyone can relate to multi-tasking and just not having enough time in the day to take care of yourself. Caregivers of all kinds go through that all the time. Nothing makes me feel better than a great blow-out! Happy Mother’s Day! I love the Dove campgains. Dove is one of my favorite brands. I love the way they make my hair and skin feel. I have always love Dove products. Like you, I rarely take time to pretty myself up, it’s shower and go! I definitely slacked on keeping up with myself. It really hit me hard this year and I am working on playing catch up! Thanks for sharing your story, this promo is awesome! I love Dove too! A collage print would be such a nice Mother’s Day gift! Dove is one of the few brands my Mom will use. Great promotion, I love getting the FREE 8X10 photos from Walgreens. They are really nice and I use them to update my photos. I’m not a mom, unless you count my kitties! But I am a HUGE fan of Dove’s shampoo and conditioner. Dove has become such a leader in what “true beauty” is… kudos to them. Beauty to me is inner beauty: kindness, sincerity, grace. 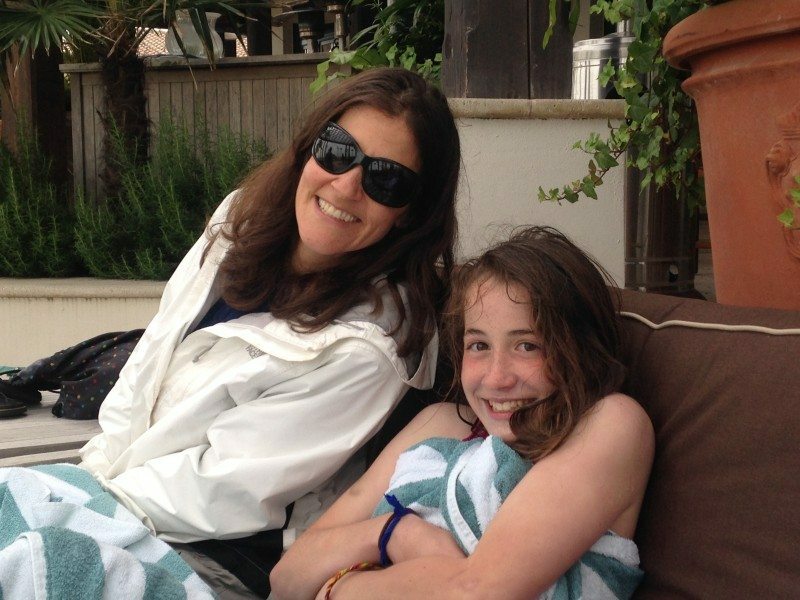 Now that I have a teen daughter, I’m especially conscious of what real beauty is! I really admire Dove for taking on this campaign. It’s so important for women and girls to feel good about themselves. I use a lot of Dove products. I think they are well made and I love that the brand helps promote self confidence.